The Story:A ballerina is recruited to 'Sparrow School,' a Russian intelligence service where she is forced to use her body as a weapon. Her first mission, targeting a C.I.A. agent, threatens to unravel the security of both nations. When the first trailer debuted, my first thought was that someone decided to make the Black Widow origin story that it seemed like Marvel was never going to get to. I mean, the similarities were all there from the get go with Jennifer Lawrence's character heading to Russian spy school to become and elite operative who would be sent on missions around the world. Well, the similarities really didn't go any farther than that as director Francis Lawrence, who worked with J-Law on all the of the Hunger Games sequels, takes this story to a much darker and more provocative place. Instead of being an action packed thrill ride, this movie is an intense, raw, slow burn that I couldn't take my eyes off of. The cinematography is a contrast in styles beauty and darkness which fits perfectly with who the lead character is and with the environments she inhabits. At first, I was a little worried about the two hour and twenty minute run time although that really turned out to be a non issue as the story was, I guess I would say, methodical but with an intense purpose. It reminded of dark thrillers from the 70's and 80's in how it let characters exist in the space and develop over the length of the story rather than rushing through introduction and exposition in an effort to get to the shoot em up action scenes. If it's action you are looking for, and I believe a lot of people are after the recent success of films like Atomic Blonde which focus on guns firing and fists flying all over the screen. 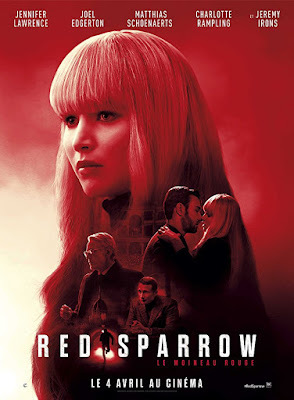 In this movie, Lawrence's character Dominika is more apt to use her brain and her body to get what she wants so the focus is more on intrigue and seduction over guns blazing action which was perfectly fine with me. Watching Lawrence throw herself into this type of role was as impressive as anything else she has done and I'm not sure why her performance isn't really being talked about at all. I honestly feel like people take for granted how brilliant of an actress she is and, while this certainly is not one of her most dynamic roles, her performance is still right there with anything else she has done and pairing her up with the underrated Joel Edgerton may have added to that as well. The average movie goes probably couldn't pick Edgerton out of a line up yet he has been one of the most consistently good actors working over the last several years going back to his breakout performance alongside Tom Hardy in Warrior. Red Sparrow is an intense thriller that goes deep into the Russian spy game and shows off strong performances from Jennifer Lawrence, Joel Edgerton, and Jeremy Irons. While this may not be the blockbuster thrill ride you were hoping for, it is a very well crafted story that is absolutely worth the effort.